Holy cow… I’m going to use math to explain fiction. These are quite the circumstances. This post today is brought to you by a post I read on The Daily Post. It’s actually a piece about a piece: a highlight of an article by Nick Ripatrazone of The Millions detailing the writing habits of short-story writer, Andre Dubus. In it, the author details his process of writing as “vertical,” rather than “horizontal”—deeply focused on character rather than the movement of the plot and eking out draft after draft. In other words, “pantsing” over “plotting,” but using more… secular terminology rather than colloquially terminology. (I did a post that talked about plotting and pantsing last time, which you can read in more detail here). Which is fine, you know. He felt that he could write better when he let the story come to him rather than map it out. He likes letting ideas “gestate” in his head before he tried to write them to paper. It makes it unique and organic. I understand. However, before everybody starts going out and trying to use “vertical writing,” I need to be sure i remind you that vertical and horizontal writing aren’t necessarily diametrically opposed to each other. In fact, they need each other. If we take the terms “vertical” and “horizontal”—if we turn storytelling into math, then we have to go back to the chart I made. So, imagine that character development lies on the Y-axis, and plot lies on the X-axis. Your story, in this case, would be like a mathematical function, where the output of the function is dependent upon the input. And when beginning writers try to choose to be a “plotter” or “pantser,” their stories come out pretty lackluster, but in different ways. This is what the story of a beginning pantser looks like. It’s a completely vertical, character-driven line. Their protagonist development is way off the charts, and may even be fully developed. You might know everything from their favorite color to their innermost secrets. You might see them finally go out on a date with that person they’ve been eyeing for six weeks. But there’s no story. The character has too much freedom, too good of a character, and doesn’t have enough conflict getting in their way. This isn’t to say that this is a bad thing. People love good characters. But if nothing happens to that character, we wonder why we’re reading about them. What can result is a story that is more like a series of episodes rather than a journey. There’s no structure—no purpose. Just a character wandering around in a story world. A beginning plotter’s story is a horizontal function. It might follow the Hero’s Journey to a T, have all of the right amount of characters and dialogue, and just fine structure. All the planning and logic seems sound. But the protagonist is choking under all of the restrictions. They’re going through motions rather than actively growing and participating in the narrative, like a good protagonist should. Conflict appears to be getting in their way, but the protagonist doesn’t seem to show it, or be moved by these conflicts. After being thwarted by several critics, the pantser and the plotter re-evaluate their storytelling skills, and start to form something resembling a story. But it’s not quite there yet. They’re on the right track, though. The character is definitely exhibiting growth at a slower pace, but it’s still travelling in a straight line. Their making steady progress to their growth as a character through the plot. You’ve probably seen this somewhere before as a writer, or in elementary school. A plot diagram. Well, in this way, a plot diagram is like a function on a chart. It’s got character growth and plot progression. But is that all a story is? Just one hill the protagonist has to climb? This is because what makes stories different from mathematical functions is that your output can determine your input. You’re not choosing some arbitrary value only for x, like you’re pulling it out of a grab bag. Your x affects your y, which affects the next x you pick, and the next y that comes out. In other words, the conflict that gets in your character’s way will create moments of joy and moments of despair dependent upon the nature of the story itself. They will grow. They will wilt. They will have points of highs, points of lows. And it is your job, as a writer, to experience, portray, and write them all, whether you know them beforehand (plotter) or not (pantser). 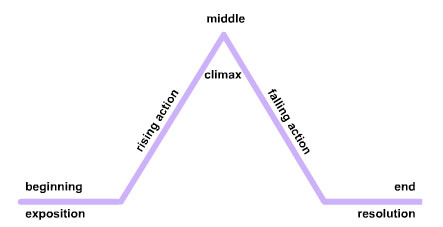 Just remember to keep ongoing conflict in mind (along with everything else necessary to good writing) so that your writing is not just a ho-hum straight line. Keep your readers on their toes with conflict, making them question if your character will get out of that valley you’ve made in your function.